Upon invitation by the Limestone Coast Grape and Wine Council the ARC TC-IWP travelled to the South East of South Australia for two days to present current work and discuss challenges faced by winemakers and grape growers in this area. 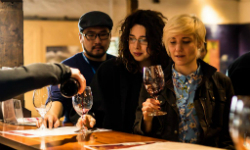 A group of PhD students, postdocs and chief investigators visited wineries in the Coonawarra to learn about this wine region and their beloved Cabernet Sauvignon. On the first day of the trip the group visited three wineries to get a taste of the range of wines produced in Coonawarra. Wynns Coonawarra Estate, Rymill Coonawarra and Raidis Estate provided tours of their winery, vineyards and of course, their cellar doors. The trip into the vineyard at Wynns provided to be very interesting, especially seeing the famous ‘terra rossa’ soil of the Coonawarra. The day ended with a beautiful meal at the Chardonnay Lodge, provided by the Limestone Coast Grape and Wine Council. On the second day of the trip all TC-IWP students and postdocs presented their most current research for the assembled grape growers and winemakers from the Limestone Coast region. All presentations were well received and a lively discussion about the direction of future research was the result of a couple successful days of industry engagement for the ARC TC-IWP. 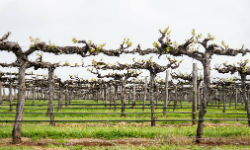 This entry was posted in Workshops and tagged Coonawarra, Industry engagement, Wine science. Bookmark the permalink.